It's sort of funny that I posted a review of Forbidden Desert before I posted a review of the original game, Forbidden Island. I guess it sort of reflects which game I like a little more. But this is not to say that this isn't a good game - but remains compelling, challenging and even brutal at times yet still very, very fun. At this point in time, I'll admit it's a little easy to dismiss Island as being the easier version of Desert, but both games are still pretty wicked. I first learned of this game because of Geek & Sundry's Tabletop, as has been the case for many of our recent board games over the past two years or so. It seemed like a fascinating play experience, plus cooperative games are usually rather fun, especially among our gaming groups. And this game certainly helps push this particular genre of the gaming world. Forbidden Island is a cooperative strategy game created by Matt Leacock, the same man who brought us Pandemic and Forbidden Desert. The game won a number of awards in 2010 including the Mensa Select Award. The game supports 2-4 players. 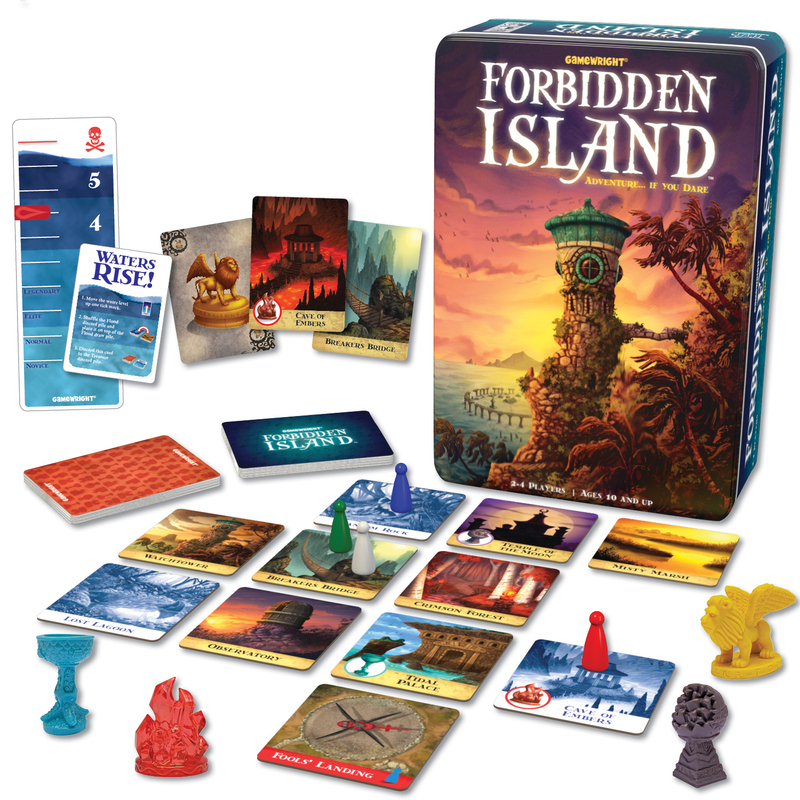 In Forbidden Island, the players are different adventures who have come to this mysterious island in search of treasure. The Island consists of some rather lovely tiles that are arranged in a grid, thus making for a random "board" every time. All adventurers have special abilities that will aid them in exploring the island and hopefully finding all the four treasures in time. To do so, players need to collect 4 cards that match the treasure and get to one of two locations (initially) where the treasures can be found. With a hand limit of 5 cards, gathering what you need isn't easy. But the twist is that the island is also slowly sinking back into the sea. At the end of every player turn, the adventurer must draw a number of flood cards (matching the different locations of the island) equal to the current flood level. For every location drawn, the tile is flipped over to its flooded version. If it was already flooded to start, then the tile is removed from the game. So if you take too long in finding the artifacts or the location Fool's Landing disappears from the map, then the game ends. But if you get all four treasures and meet back at Fool's Landing with an Airlift card in hand, then you can escape with the spoils of your explorations. At first glance, the game naturally shares a lot in common with Pandemic, which makes sense given it's from the same designer. But given the much smaller playing area, there's a significant twist in the way the game works that really spells the difference. In Pandemic you'd get Epidemic cards mixed in with the good cards that you need to win the game. Once played, the card is removed from the game. In Forbidden Island you have Waters Rise cards mixed into the Treasure deck that you must draw from every turn. So while this is the only way to gather the needed Treasure cards to claim the mysterious elemental treasures, it also means you risk making things worse. The Waters Rise card increases your marker up by one notch on the Water Level marker. This may or may not change the number of Flood Cards that are drawn at the end of the turn depending on where you are on the meter. Then all the cards that had been drawn are shuffled and put back no top of the Flood deck, and thus can be draw again. Then players Flood cards are drawn as normal. The only caveat is that the Waters Rise card is placed in the discard pile of the Treasure deck, and thus will come back when the Treasure Deck reshuffles. And yes, the deck will reshuffle several times over the course of the game, thus escalating the danger. With three of those evil cards in the deck and more and more of those Treasure cards sitting in your hands as you try to gather what you need to collect the treasures, things can get pretty bad really fast. Of course since this is a cooperative game, all players need to survive in order to win. And given the whole flood element and the fact that parts of the island are disappearing, it is very possible that one of your adventurers may get trapped and eventually lost. And that ends the game for all of you. Players can only move in the four basic directions - no diagonal moves (unless you are the Explorer who is allowed to move diagonally), so your movement options can get pretty limited really quickly. Only the Diver can cross completely flooded (meaning parts of the map where the tile is gone) areas. Like all other games of this nature, one is only limited to 3 actions per turn. These include moving a space, shoring up a flooded tile, giving a Treasure card to another player, or capturing a treasure once you have the 4 cards matching it and you're at the right location. Thus the special player abilities become all the more important to making the most of your game. The other roles that I haven't mentioned are the Engineer, who can shore up two tiles at a time, the Pilot, who can move to any tile once more turn, the Navigator, who can move other players up to two spaces for a single action, and the Messenger, who can give Treasure cards to other players without needing to be on the same space. There are a few bonus Special Action Cards in the Treasure deck that are free to use that can help in a pinch, but you can only do so much when the island is disappearing all around you. And that pretty much sums up the game, admittedly in a less than ideal narrative order now that I look back at things. I think my only complaint beyond how a bad shuffle can kill you fairly quickly is the fact that the maximum number of players is capped at 4. I'd love to have more players involved in the game, but at the same time I can see how the game mechanics would totally break with even just one more player. Regardless, Forbidden Island is a very clever game and a fresh take on the Pandemic style of gameplay that many of us gamers have grown to love (and hate). I still feel delightfully challenged whenever we pull this game out for game nights and we've at least reached a level of skill where we tend to win most of the time. If we're lucky. The game rates a great 4 flooded island locations disappearing out of view out of a possible 5.